Wandering was first settled in 1866 when the first freehold lots were granted to George and John Watts whose wandering horses some 5 years earlier had found what is now the local property of Grassdale. The local authority (Wandering Roads Board) was created in October, 1874. 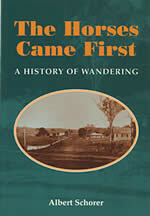 The book titled "The Horses Came First" ($26.25 inc GST), reprinted in 1999 for the 125th Anniversary Celebrations of local government in Wandering is available for purchase from the Shire Office. The book, by Albert Schorer in 1974, details the history of the Wandering Shire and contains over 90 historical photographs. Books can be purchased at the Shire Office or posted via Australia Post. Contact the Shire Office for details. Also collected in 1999 and produced into a book titled "Snap Shot of Old Buildings in Wandering" is some 40 photographs of the older buildings in the Shire together with some of their history. This book is currently out of stock. A book titled "History of the Pioneer Schools in the Wandering Shire" which details the history of the various schools and various reminiscences is currently out of stock at the Wandering Shire Offices.